In a previous post I made the argument that the Ten Commandments did not begin at Mt. Sinai. Today I want to go on to demonstrate that neither did they end at Mt. Calvary. Just as the Ten Commandments were not the revelation of a new standard of righteousness so they have never been replaced by any newer standard. Certainly the revelation given to us in the Bible is progressive. Genesis 3:15 announces good news of salvation through a Savior as does John 3:16, and it is obvious that the latter is stated more clearly than the former. But they both declare the same message. In a similar way, though we have much clearer revelation in the New Testament concerning the breadth and spirituality of the Ten Commandments, we do not find them set aside or replaced by a higher law. On the contrary, Jesus specifically asserted that He did not come to destroy or set aside the law. In the very sermon where He elucidates the comprehensiveness of the Ten Commandments, He said, “Do not think that I have come to abolish the Law or the Prophets; I have not come to abolish them but to fulfill them. 18 For truly, I say to you, until heaven and earth pass away, not an iota, not a dot, will pass from the Law until all is accomplished. 19 Therefore whoever relaxes one of the least of these commandments and teaches others to do the same will be called least in the kingdom of heaven, but whoever does them and teaches them will be called great in the kingdom of heaven. 20 For I tell you, unless your righteousness exceeds that of the scribes and Pharisees, you will never enter the kingdom of heaven” (Matthew 5:17-20, 17). Further, New Testament writers regularly appeal to the language of the Ten Commandments when explaining what God requires for holiness. Sometimes the sins forbidden in the Ten Commandments are partially listed (Mark 7:20-22; Romans 1:29-31). 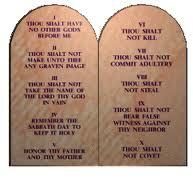 At other times, the commandments themselves are partially listed (Matthew 19:18; Romans 13:9). Beyond this, each of the Ten Commandments is found in the New Testament. —Paul made this point in his sermon on Mars Hill when he preached “the unknown God” to the Athenians (Acts 17:22-31). —Matthew 5:27-30,“You have heard that it was said, ‘You shall not commit adultery.’ But I say to you that everyone who looks at a woman with lustful intent has already committed adultery with her in his heart. If your right eye causes you to sin, tear it out and throw it away. For it is better that you lose one of your members than that your whole body be thrown into hell. And if your right hand causes you to sin, cut it off and throw it away. For it is better that you lose one of your members than that your whole body go into hell. —Colossians 3:5, Put to death therefore what is earthly in you: sexual immorality, impurity, passion, evil desire, and covetousness, which is idolatry. The standard of righteousness in the New Testament is the same as it is in the Old Testament. The Ten Commandments summarize what that eternal, unchanging standard is. Those commandments reveal to us God’s will. They show us how we are supposed to live as men and women made in the image of God. We who live in the light of the full revelation of God in Jesus Christ have a higher obligation to pursue holiness that is revealed in that standard than those who lived under the Old Covenant did because we have more light than they did. But the standard remains the same. The God who told His Old Covenant people to “Be holy for I am holy” says nothing less or nothing different to those of us living on this side of the revelation of Jesus Christ. And that holiness is summarized in the Ten Commandments. I realize that there are peculiar challenges in how we are to apply the 4th commandment regarding work and sabbath rest. But those challenges are no grounds for dismissing it or for rejecting the Ten Commandments as an abiding summary of God’s righteous requirements of His image-bearers. That, however, is a discussion that must await another day.